While the rest of the country has been suffering through a truly heinous winter with -50 degree winds, never-ending snow, and icy roads covered in car-degrading salt, Californians across the state have been horrified to hear their own fate: a low of 35 degrees. Heavens! When will our afflictions be over? Is there no god above to protect us from this hell? Thankfully, we powered through and are back to just “chilly” (that’s what 60 degrees feels like to our delicate bodies). It’s a Christmas miracle that we came out alive and can appreciate the little things in life once more. Like food. 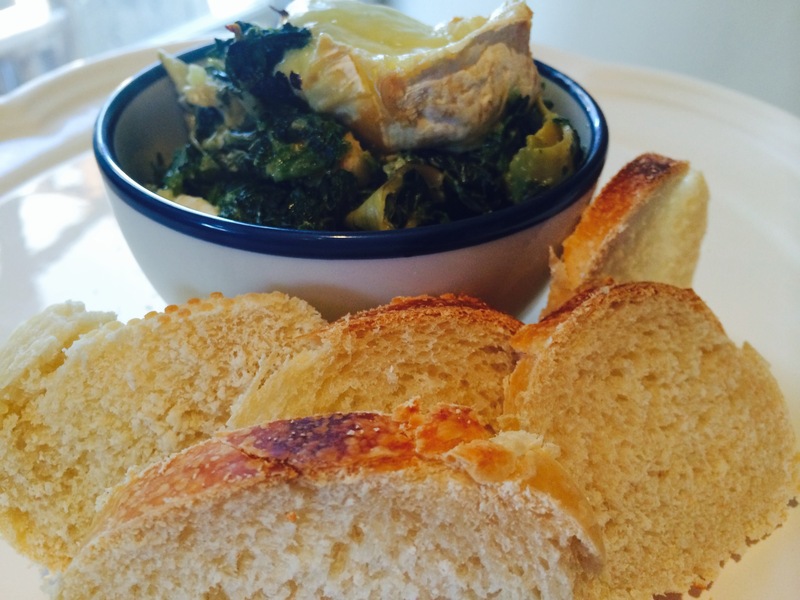 I’ve always had a bit of a love-hate thing going on with spinach dip. Oh sure, it’s a wonderland of creamy, spinachy goodness, but you’ll always encounter a mega mayo fan who puts the ratio at 10:1 and ruins it. There’s nothing like a palate full of mayonnaise to remind you of how life was so good without it. 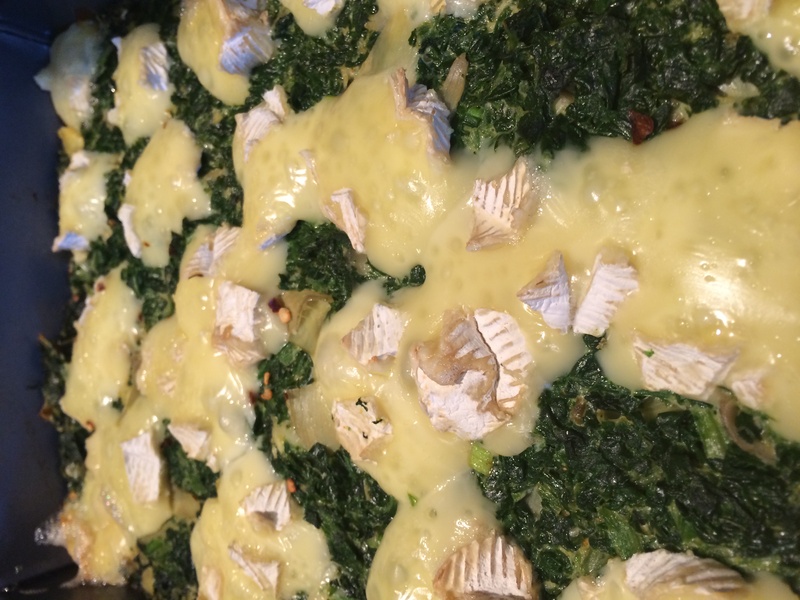 Obviously, it’s all based on personal preference, so my attempt is to go for more spinach, a touch of brie, and a kick with some spice. This isn’t a gooey recipe, so if you want more creaminess I would increase the sour cream by another half cup and maybe add some cream cheese chunks for a festivus flair. Preheat your oven to 350 degrees and grease a 9″x 13″ baking pan. Press the spinach in a dish towel to get out as much moisture as possible. In a large bowl, mix the spinach, artichokes, parmigiano, sour cream, green onions, mustard, paprika, red pepper flakes, and salt. 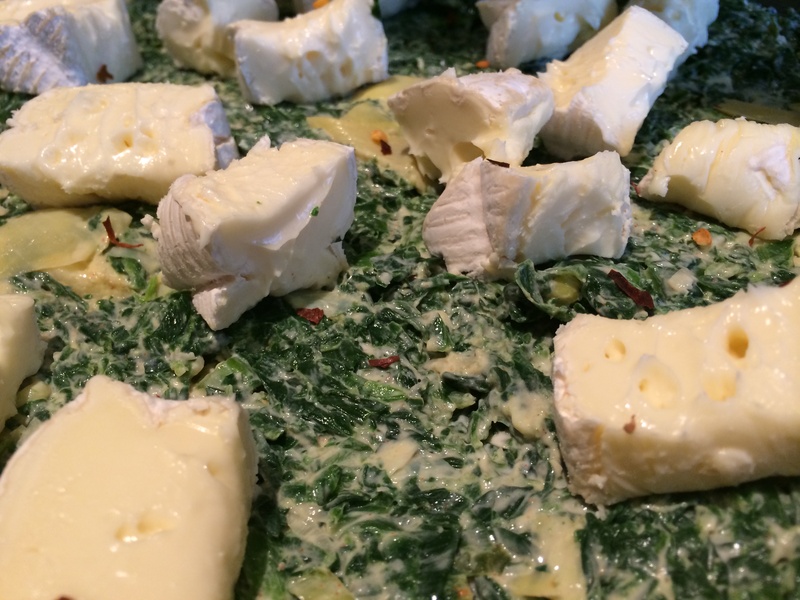 Cut the brie triangles into 1/2″ — 1″ chunks and layer half onto the bottom of the baking pan. 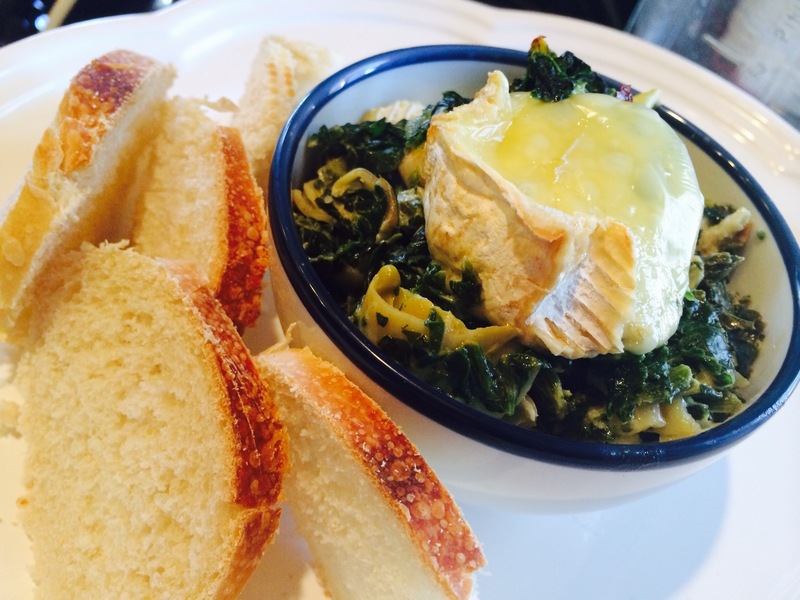 Spread the spinach on top and layer the rest of the brie on top of that. Bake for 35-45 minutes or until brown on top. Serve hot with sliced baguette, crackers, etc. I know it will be hard, but try not to be too jealous of this awesome meal I just consumed. I can feel your efforts straining across the world wide web, and I pity you. I felt inspired by a friend’s description of his Tuscan dinner as the best dinner this year, so I decided to grab that metaphorical bull by his gnarly horns and craft my own. It almost proved impossible as my cupboards are fairly dismal, but being resourceful and so fabulous, I made the most of what I had. The result? 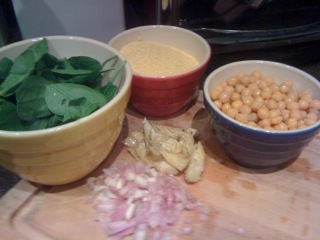 The Odd But Delicious Creamy, Lemony, Chick Pea, Spinach, and Arugula over Garlic Polenta. That is the full title. If you know me at all kitchen-wise, you know it’s very difficult for me to use recipes. Cooking is like Jazz music, baking is like Classical. There is a time to improvise and a time to follow the rules, and cooking with rules is like drinking non-alcoholic beer: where’s the fun? Tonight was no different: I looked at what I had, closed my eyes, and ate the result. Half-way through this experiment I was thinking it might be one of those nights where I try and feed my cat one of my failed attempts at genius, but I was so very wrong. 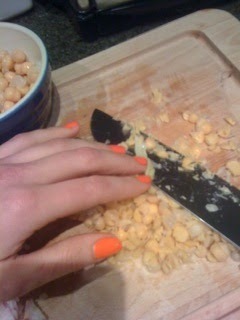 My thinking all along was to have a creamy, garlic-y polenta with some form of chick peas on top. To make it saucy I mashed up about half of the peas and added lemon juice, wine, and cream. The greens gave it color and a good bite from the arugula. And it all took about 10 minutes. If you’re into meat then I would add some grilled chicken, possibly marinated in some garlic-rosemary-buttermilk. 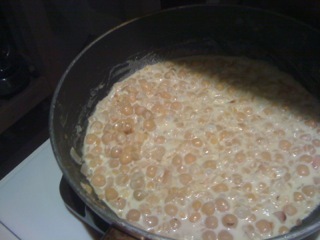 Mash about half of the chick peas. If you want this to be really smooth I would recommend blending them with the lemon juice. 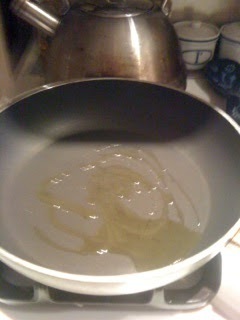 Heat the olive oil in a saucepan over med-high heat. 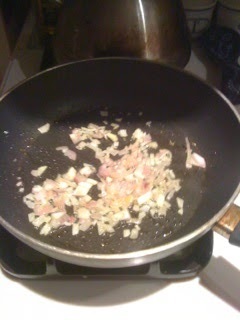 Saute shallots until translucent and add the chick peas. Cook until hot, then add the wine and reduce a bit. Toss in the lemon juice and continue cooking until everything “comes together”; ie when it starts to look like a cohesive mass and not separate ingredients, about 3 minutes. 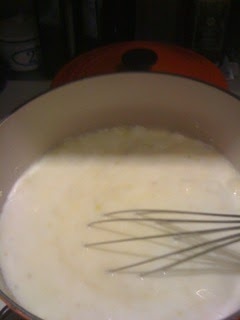 Add the cream and artichoke hearts and let cook until thickened. Turn off the heat and add the greens, mixing until it’s one dreamy mass of delicious. Cut the top of the head of garlic off (a few millimeters worth, just to expose the meat inside), drizzle on some olive oil, and wrap in foil. Bake at 400 for 20 minutes. 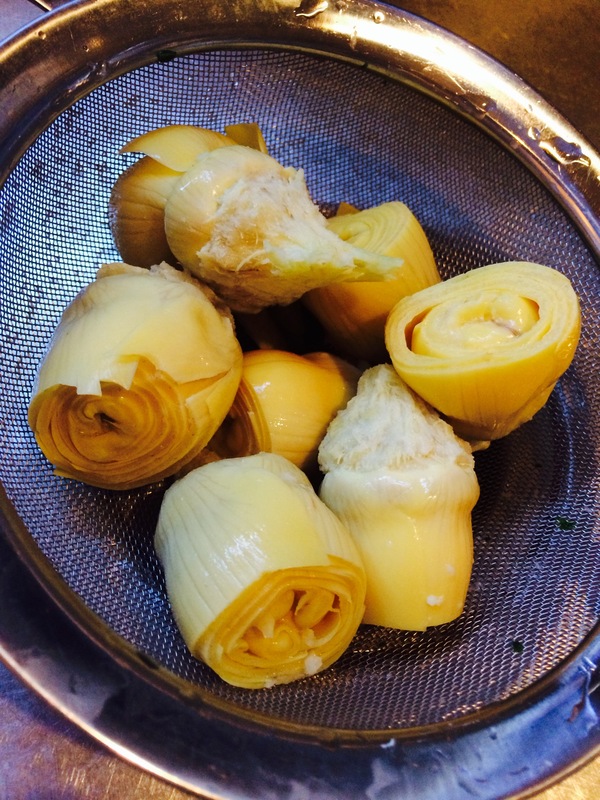 Pop them out of their little sleeves, then mash with some salt and olive oil until it forms a paste. Bring the water and cream to a boil in a medium sized pot. 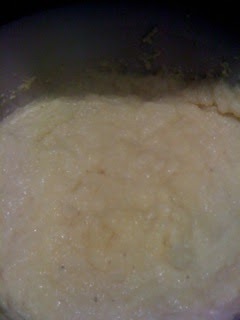 Reduce the heat to a simmer and slowly whisk in the polenta. 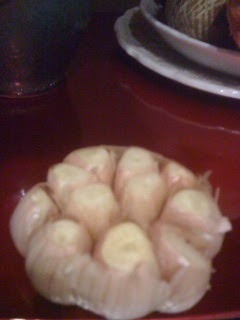 Stir in the garlic paste. Dish up some grub and dive in.